Skip long lines and enjoy a hassle-free entry to Uffizi Gallery, the treasure house of Renaissance painting and sculpture and one of the foremost tourist attractions of Florence. A visual treat for art lovers across the world, the gallery houses works of the masters of the Renaissance period like Botticelli, Mantegna, Correggio, Leonardo da Vinci, Raphael, Michelangelo and Caravaggio! This tour does not operate on the first Sunday of every month during winter sesason. Florence Hop-On, Hop-Off Tour: The ticket is valid for 48 hours. Florence City Tour (Line A): April to September: 9am to 6pm, October to March: 9am to 4:30pm. Frequency: 20 to 60 minutes. Full Loop: 60 minutes. Florence Fiesole Tour (Line B): November to March 10:15am to 2:15pm, March to April 10:05am to 5:05pm, April to June 10:05am to 6:05pm, June to September 10:05am to 7:05pm, September to October 10:05am to 5:05pm. Frequency: 60 minutes to 2 hours. Line C: April to October: 9:20am to 5:30pm. Frequency: 60 minutes (28 Mar to 12 Jun) Full Loop: 2 hours. *Operating hours are subject to change. Please check operating times when you board the bus. Before start of the guided tour you must redeem your vouchers from the Sightseeing Experience staff located at Stop No. 1 of Line A City Sightseeing, Florence (at least 1 hour before the start time for the guided tour) or directly on the bus once you board. You can also exchange your voucher the day before the guided tour, from the Sightseeing Experience staff located at Stop No. 1 of Line A where you can ask for more information on the service, meeting point of the guided tour, bus location and tour map. Enjoy the recorded commentary available in various languages. Uffizi Gallery guided tour: Information on the meeting point of the guided tour will be provided at the Sightseeing Experience Visitor Centre. Please arrive at the meeting point for the guided tour at least 15 minutes before the start time. Florence hop-on, hop-off tour: You can hop off the bus at any off the stops. Hop on the bus at any of the designated stops. Explore Florence atop an open-top bus and visit the major attractions of the lovely city as per your preference. 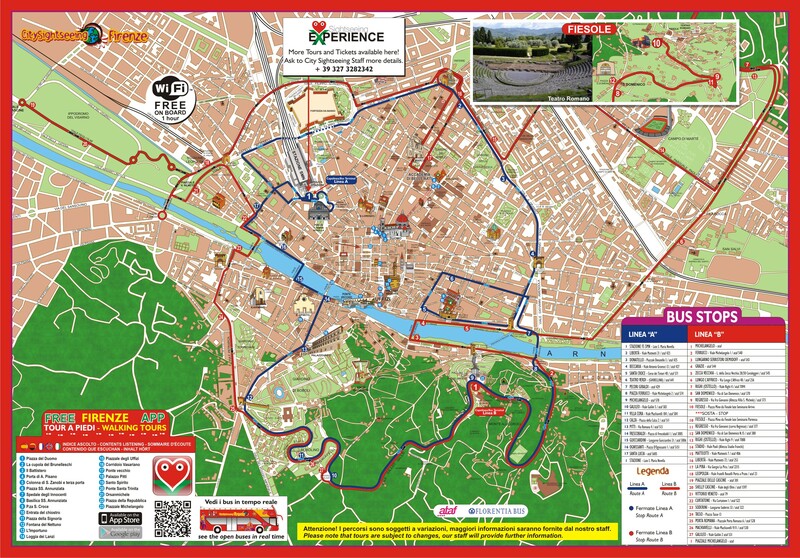 The 30 stops cover all of Florence’s main attractions such as the Cathedral or Duomo, Santa Croce, San Marco, Maria Novella, Boboli Gardens, Church of San Miniato al Monte, San Marco, Piazza Della Liberta and Piazzale Michelangelo. Meet your tour at gate number 3 of Uffizi Gallery at the scheduled time. The Uffizi Gallery boasts the world’s single largest collection of Italian and Florentine art. Explore the gallery with a well-informed guide and study the invaluable collection of Primitive and Renaissance paintings including the masterpieces of Giotto, Leonardo da Vinci, Raphael, Michelangelo and Caravaggio as well as works of German, Dutch and Flemish Masters including Durer, Rembrandt and Rubens.Recorded commentary is available in Italian, English, Spanish, German and French. View the highlights of the Uffizi Gallery and learn about the artworks and the masterpieces that you see on a 1 hour and 45 minutes tour. After the tour, you can continue sightseeing in Florence on your own. Before you get to the Uffizi Gallery, you must redeem your vouchers from the Sightseeing Experience staff located at Stop No. 1 of Line A City Sightseeing, Florence. Remember that you MUST EXCHANGE your voucher at least 1 hour before the start of your guided tour. You can also exchange a day prior to the visit. The travel date and time indicated in the booking voucher is the date of the guided tour and cannot be modified. The start point for the guided tour at the Uffizi will be communicated while you exchange the voucher at the Sightseeing Experience Visitor Center. Due to public works, from today until next days, buses of Line A may have some delays. STOP N.1 LINE A City Sightseeing Florence has been moved in front the MAIN EXIT of the central train station Santa Maria Novella, but the address still is ‘Piazza Stazione’.